"Friday night, a packed house, two 11-0 teams, it was a great game" said Derryfield boys basketball coach Rob Bradely, who knows that despite the loss in this game there is still a long way to go before the Division IV champion is crowned. In a game that had tournament-like intensity, Newmarket 5'10" senior guard Adrian Edgerly showed why he is one of the best players in D-IV. Edgerly dropped 27 points, including 13 in the 2nd quarter alone. 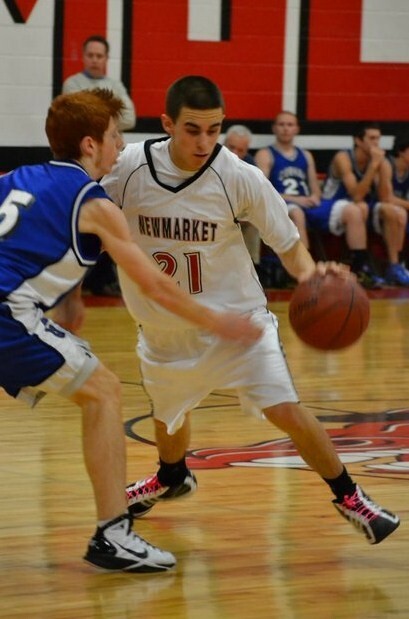 He also dished out 6 assists, grabbed 4 rebounds and had 2 steals, as Newmarket improved to 12-0 on the season with a 60-56 win over Derryfield. Two teams that were 11-0 going into this game battling hard for all 32 minutes. Every kid who played in this game left it all out on the floor. It was a packed gym where players from both teams were hitting big shot after big shot down the stretch. What more do you want on a Friday night? "This was awesome" said Edgerly. "I love playing in games like these." Derryfield actually jumped out to a quick 18-9 lead in the 1st quarter. The most impressive thing about the hot start for the Cougars was that 6 different players had already scored (Garrett Lamp, Gus Davis, Marty McCormick, Anuj Vadalia, Alex Zorn and Bryan Rivard). Newmarket came storming back, though. They ended the quarter on a 7-0 run and it was 18-16 Derryfield after 1. Newmarket kept the momentum rolling into the 2nd frame. Edgerly drilled back-to-back three-pointers to begin the quarter, and on the second one he banked it in off the glass from the left wing (he didn't call glass though!). "That was definitely the turning point in the game" said Edgerly. "When I hit those 2 shots we ran the same play both time. It's designed to get me open on the wing so I can create something off the dribble. They sagged off of me defensively though, so I shot it." As big as those 2 shots were by Edgerly, if you ask Newmarket head coach Jamie Hayes he would tell you that defense was equally as crucial. "The difference was our defense" said Coach Hayes. "Our guys really stepped up down there tonight." The most impressive defensive stand by the Mules came late in the 1st half. Newmarket was protecting a 32-26 lead when Derryfield had the ball looking to cut into the lead heading into the locker room. The Cougars had the ball for a good 40 seconds but came up empty. They patiently worked the ball around the perimeter trying to get someone a good look at the rim, but it didn't happen. Newmarket buckled down and played good team defense. Not many teams can defend well in the half court for 40 seconds. The Mules did it right there. Newmarket would build their lead to as many as 7 points on multiple occasions, but Derryfield just kept battling back. The Mules led by 6 at the half, but then 6'5" center Garrett Lamp (16 points and 9 rebounds) converted back-to-back inside hoops to make it a 32-30 ballgame. Senior guard Anuj Vadalia (12 points) was also playing well for the Cougars. He was doing a little bit of everything, especially attacking the basket off the dribble and crashing the boards. "He's a very good player for us" said Coach Bradely. "Anuj is a good rebounder and a tough kid." Vadalia made a strong drive and and-1 finish from just inside the foul line. However on that play it was one of the more bizarre foul calls I can recall. The official who made the call was way back on the other side of the court around the opposite foul line when he blew the whistle. It was the farthest away from the play I have ever seen an official make a call. Derryfield kept making runs to cut the lead down to 2 or 3, but Newmarket kept answering back. The Cougars cut the lead to 35-32, but then Mules guard Christian Filion (11 points) drilled his third three-pointer of the game to push the Newmarket lead back up to 6, 38-32. "Christian gave us a lift tonight" said Hayes. "He is coming back from an ACL injury that kept him sidelined for awhile. But his knee is now getting better." After newmarket increased their lead to 41-34, lamp answered back for derryfield with another nice move to the hoop and finish. Again, Newmarket answered back to push the lead to 45-38 heading into the 4th. Davis had a good look at the basket off an offesive rebound at the end of the 3rd. His 15 footer went in and out, a tough break for the Cougars as the shot would have given them momentum heading into the game's final frame. To start the 4th Edgerly was fouled hard on his way up after a strong drive to the rim. It should have been a flagrant foul, but the officials only called a personal. Edgerly was clearly shaken up on the play, and as a result he missed his next 3 free throws. Meanwhile 6'2" forward Alex Jenney hit a pair of fouls shots for Derryfield (they just refused to give up) and the Newmarket lead was down to 45-42. That's when Edgerly regained control of the basketball game. In the 2nd quarter he did it with his ability to score the basketball, going off for 11 points in the quarter. Now though with Derryfield's entire defense focused on stopping him Edgerly began to find his teammates for easy baskets. On back-to-back plays he penetrated into the lane, was double teamed and then found forward Ryan Carpenter underneath for easy layups. After a VERY nice coast-to-coast play by senior guard Alex Zorn where he put the ball behind his back to avoid a defender and then finished strong at the rim, Edgerly again went back to work. Once again he put the ball on the floor to drive and was immediately double teamed by the Cougars. This time he found Josh Eisfeller with a nifty pass wide open under the basket for 2. "It's not about the numbers with Adrian" said Hayes. "It's about the scoreboard. That's all he cares about." It looked like Newmarket might have the game in hand. But once again Derryfield just kept battling. Vadalia had a couple of quick hoops, and then a layup by Lamp cut the Mules lead to 54-50 late. "I am proud of the way we hung in there" said Bradely. "Even when they pushed the lead up to 7 we stuck with it and then kept trimming the lead back down." The game really started to get chippy late. You had the hard foul on Edgerly early in the 4th. You had an intentional foul which was called on Lamp. You had trash talk, and elbows being thrown around on both sides. Things were getting heated, and the officials were trying to keep it under control. Two players who were having rough nights so far were Rivard for Derryfield and sophomore Christian Hawkins for Newmarket. They both came up with big baskets down the stretch. Late in the game Hawkins had 0 points and 4 turnovers, but he hit a clutch shot after Derryfield had cut the Newmarket lead to 54-50. After a nice drive and kick-out by Edgerly, Hawkins caught the ball in the right corner and hit the shot. It appeared to be a three-pointer but the officials said that he had a foot on the line, so it was a long 2. After that shot it was really a fast and furious last couple minutes to this game, with a combined 12 points being scored in about a minute and a half. After an inside shot by Vadalia, and Filion hitting 1 of 2 free throws, Lamp hit a 15 footer to cut the Mules lead to 57-54 with 35 seconds left. Edgerly drilled 2 free throws, but once again The Cougars were not giving up yet. Rivard stormed down the court and made an acrobatic move to the basket, laying it in off the glass (lots of contact underneath but no call). The shot once again cut the lead to 3, with Newmarket up 59-56 with 8.4 seconds left. Edgerly made 1 of 2 free throws though to seal the win. Newmarket is 12-0 and sits atop the Division IV standings. But having now seen each of the top 3 teams in the division - Newmarket (seen them twice now), Moultonborough and Derryfield, I wouldn't say the Mules are a lock for the title by any means. I actually think Moultonborough is a better basketball team, as their size inside would really frustrate Newmarket and Moultonborough also has strong guards. Pittsfield however does have very good size as well (with 6'9" Ben Hill and 6'3" Donoven Emerson) and Newmarket beat them 53-41. That was however way back in December and Pittsfield had some big injury problems at the time. What the Mules have going for them is their quickness, skill and athleticism on the perimeter. Their back court of Edgerly, Hawkins and Filion is unmatched in D-IV. As for Derryfield, I wouldn't be surprised if they lost a couple more games down the stretch. Still, this is a team that went to the semi-finals last year, has 3 returning starters and 7 seniors who were all contributors a year ago. They're a scrappy bunch who will be a tough out in the tournament. Also worth noting - the JV game was also very exciting. The gym was as packed and as loud as any JV game I have seen thus far this season. In the end, Newmarket guard Bryan Jordan hit the game winning three-pointer at the buzzer from the right wing to win it for the Mules.